Here with I would like to inform you about some changes made by UEC BMX Commission for the season 2011 and 2012. One of them is as for higher power and other, either according to your proposals (at Convention) or our monitoring during the race season 2010. More changes could be done after meeting UCI and UEC Commission at begin of December 2010 but only up the race season 2012.
rounds 3&4 2011 is Zolder Belgium. Zolder is very known by UEC for good organization, so I don`t doubt it will be this time as well so. •As the UCI cancelled the Cruiser as Championship class, we do this as well, but cruiser will stay as class Challenger only during all races. •From this season we allowed the shot pants during the practice and racing, but only with full protection of shine bone and knee and only for the Championship classes. No respect of this rules will lead automatically to disqualification of riders. •European Challenger under 12, stays integral part of races at Haaksbergen (Finals) according to UEC Competition. Rules from Challenger 9 and over (all classes) 8 and under are not allowed to start at Championships. •Organizer of European Championships rounds 2012 are: Valkenswaard, Geneva, Leeuwarden, Kortrijk and Creazzo. •Organizer of Finals 2012 is FFC as already announced. •Organizer of Finals 2013 is Belgium Cycling Federation (at Dessel). 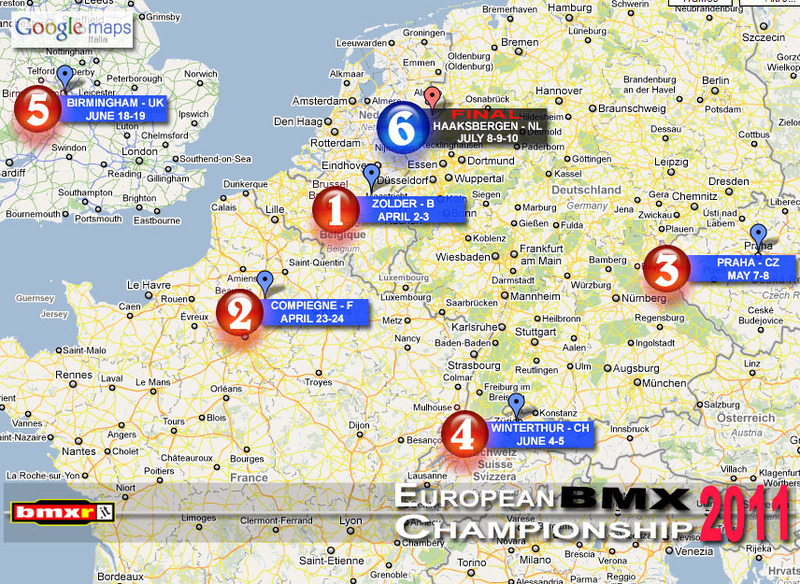 •The next UEC BMX Convention will be held up at 5th of February 2011 and as for full calendar (Olympic year 2012) will be last one till 2013. Here we are looking for host Federation for this Convention. If you have wish and possibility that we organize them at your country, please let us know soon. •The competition rules, for Championship classes, Challenger classes, Cruiser and international races will be complete two or three weeks after BMX Convention. •Attached you will find UEC BMX calendar for 2011 and 2012, this is already done in agreement with UCI but please note: each organizer Federation have to fill UCI Calendar form and send it to Mr. J. Lindstrom before 15th of December. Your Federation got this form and all instructions how to do this. Calendar 2011 is already closed and confirmed. •During European Championship rounds 1&2 at France, we organize only one round for the Challenger classes as Two rounds with so many riders where not possible to run within two days. •With separate mail I will send today to all organizer of Rounds and Finals 2011 and 2012 the Charge books, Recommended time schedule, and Calendar.